That’s all I learned about them! Remember, this was before I had access to all the knowledge of mankind through this mythological oracle known as “Google”. Back in those days (the 1990s), if you couldn’t find an answer in the World Book Encyclopedia or at the local library, you just had to say “Well … I guess I’ll never know about that.” We truly live in remarkable times! According to the all-knowing Wikipedia, the cornucopia gets its name from Latin with “cornu” meaning “horn” and “copia” meaning “plenty”. Seriously? This is all my teachers knew? … I think not. You see, the rest of the story comes from Greek mythology and, like many stories from mythology, it can be very PG-13. Not something too appropriate for kids. Nevertheless, I’ll try to keep this blog post PG rated for young readers. Luckily, like many stories in mythology, there are multiple versions to pull from and we’ll skip some of the bloody bits that are unnecessary for our purposes. Our story starts off with the birth of Zeus, the youngest son of the Titans, Cronus and Rhea. There was one problem, Cronus had eaten Zeus’s siblings: Poseidon, Hades, Hestia, Demeter, and Hera. (See how this could be PG-13?) However, Rhea had a plan. She gave Cronus a rock swaddled like a baby to eat instead, and hid baby Zeus in a cave on Mount Dicte on the island of Crete. In the cave Zeus was raised in secret with the help of nymphs and a goat named Amaltheia. Her milk helped young Zeus grow strong. Soon came the day when Zeus was mature enough to claim the Kingdom of the World. However, Amaltheia had two parting gifts for Zeus – her skin and one of her horns. She was then placed among the stars in Capra, the constellation surrounding Capella. Her hide was used to create Zeus’s mighty thunder shield, Aigis. When the constellation Capra rises, it marks the start of the stormy season on the coasts of Greece. In ancient Greek the word “aigis” means both “stormy weather” and “goat skin”. Zeus went on to liberate his brothers and sisters by giving Cronus an herb that made him vomit them up. They then battled Cronus and the other Titans in the underworld, Tartarus. After overthrowing Cronus, Zeus was confronted with giants and also the monster, Typhon, which he both defeated successfully. The time had come for Zeus and his siblings to rule. Justly, Zeus drew lots with his brothers Poseidon and Hades to let luck determine who would be king of the gods. Zeus won the draw and became the ruler of the Earth and Sky and the Lord of Mount Olympus, the highest mountain in Greece. That’s it! (Minus the graphic bits.) 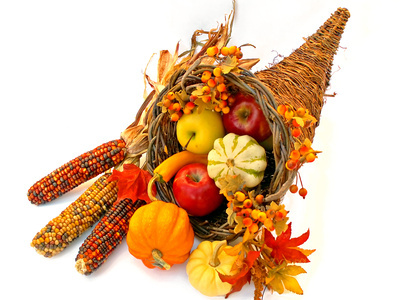 The cornucopia originates with the mythology of ancient Greece. So how did it become associated with an American holiday? In the “old world” cornucopias were a symbol associated with wealth and prosperity. It only made sense to use this symbolism to attract settlers to the “new world”. This can be seen in this 1876 pamphlet from Southern Pacific Railroad. Later, during World War I, it was used to promote home canning (below). This is where we see the shift to the Thanksgiving holiday, when those canned goods would be celebrated. This Thanksgiving open up a jar of canned goods, think of Uncle Sam (who looks kind of like Zeus), and count your many blessings.